WTC specializes in the underground installation of utility cables, fiber optic cable, copper cable, electric cables, and coaxial cable using trenching, plowing, boring and aerial applications. 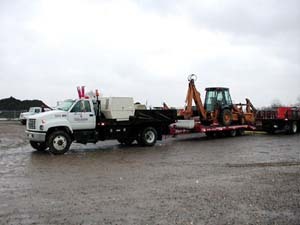 One of our most valuable assets is this combination rig. 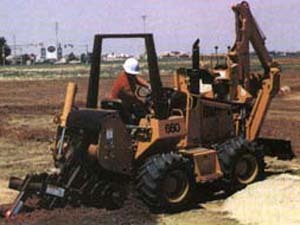 The back hoe makes for efficient removal of surface dirt and the bed-mounted generator allows numerous tools to be deployed in the course of installing, repairing, or maintaining underground utilities. One of the most efficient and timely methods for burying conduit or cable is to utilize an Inline Bore. Capable of boring up to 1000 feet in a single shot, this device allows WTC crews to cover great distances rapidly, and accurately. This machine is also very capable in congested underground environments and for placing multiple configurations of innerduct under rivers, streams, railroads and roadways. 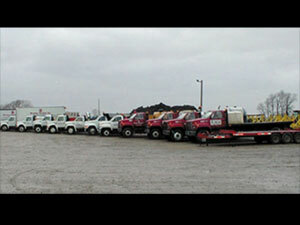 WTC utilizes a large fleet of trucks, vans and equipment for it's underground and aerial cable division. The ability to deploy needed resources to a given site in a timely manner and getting jobs completed on schedule has given WTC a solid reputation within the industry. In certain cases it is more efficient and just as effective to trench in utilities pathways. 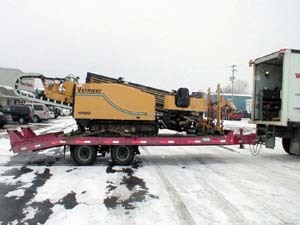 As part of the available underground utilities fleet, the trencher is a part of the overall means that WTC deploys to meet various project requirements. Flexibility is paramount to delivering quality underground cable services.